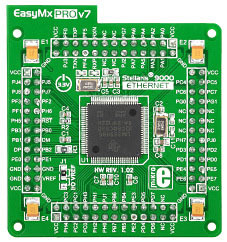 EasyMx PRO v7 for Stellaris® ARM® is a development board for Stellaris® ARM® Cortex™-M3 and Cortex™-M4 devices. It contains many on-board modules necessary for device development, including multimedia, Ethernet, USB, CAN and other. 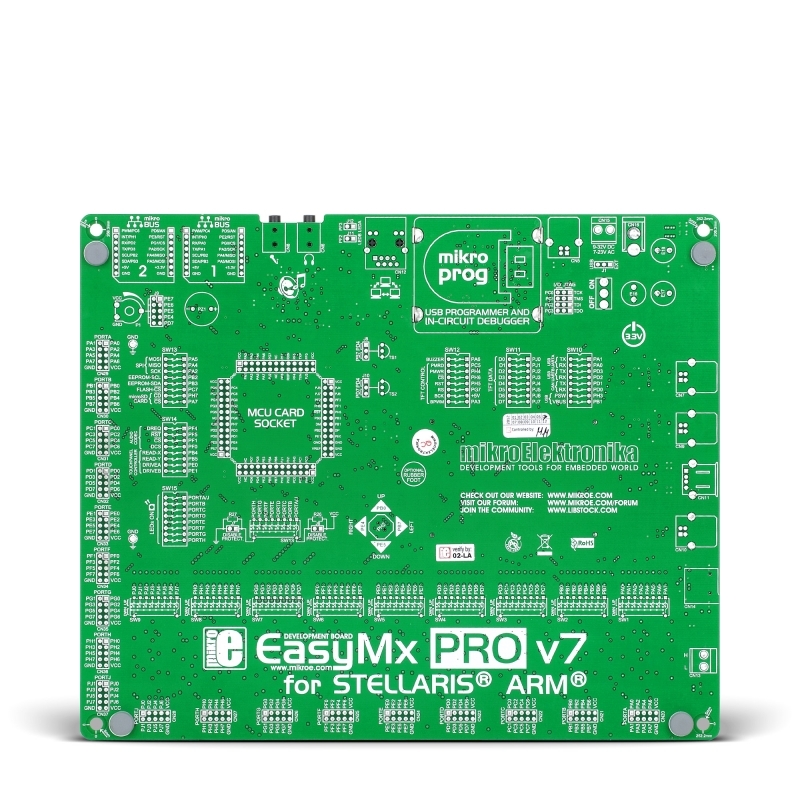 EasyMx PRO™ v7 for Stellaris® ARM® is a full-featured development board for Stellaris® ARM® Cortex™-M3 and Cortex™-M4 microntrollers. It contains many on-board modules necessary for development of variety of applications, including multimedia, Ethernet, USB, CAN and other. 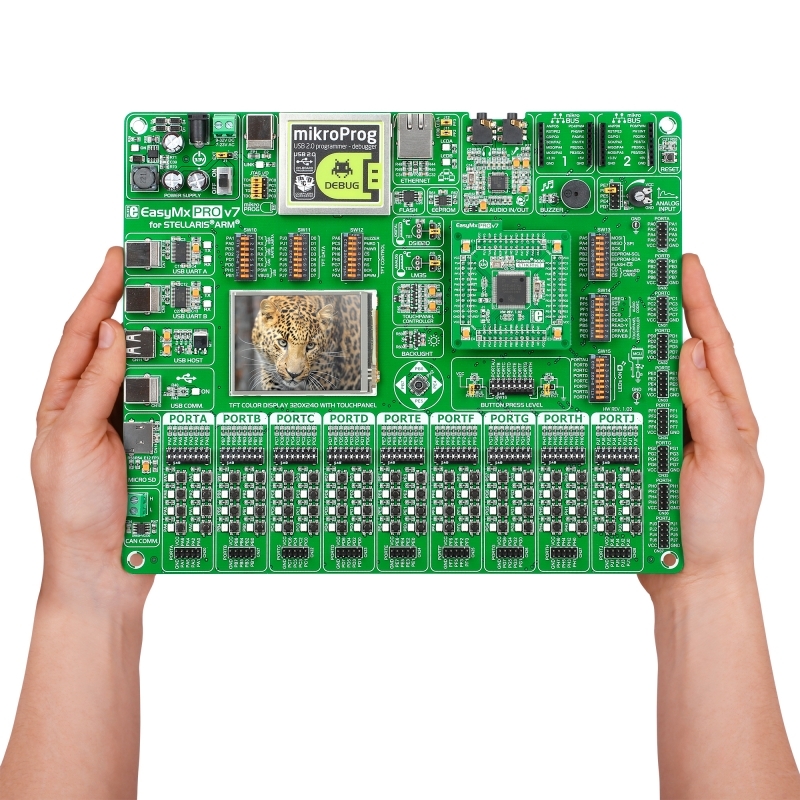 On-board mikroProg™ programmer and debugger supports over 270 ARM® microcontrollers. Board is delivered with MCU socket containing LM3S9B95. 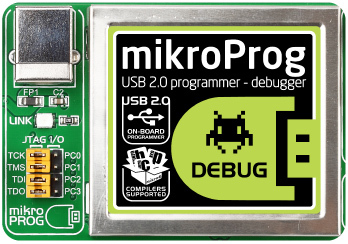 mikroProg™ is a fast USB 2.0 programmer with hardware debugger. 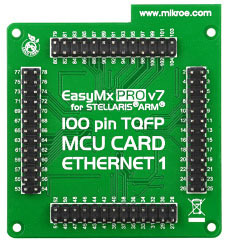 It supports over 270 Stellaris® ARM® Cortex™-M3 and Cortex™-M4 microcontrollers from Texas Instruments®. Outstanding performance and easy operation are among it’s top features. 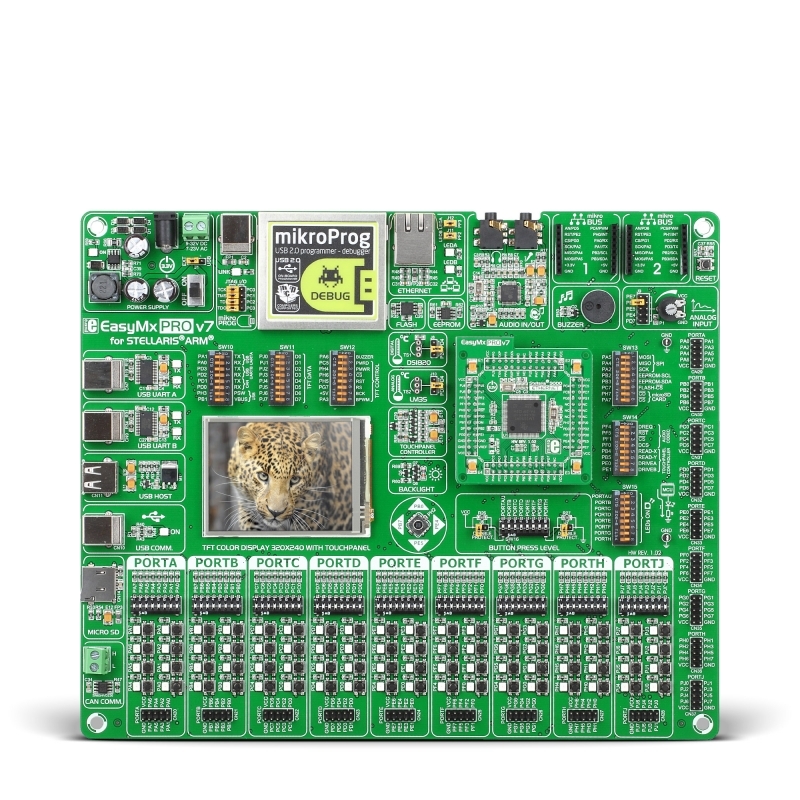 It features a hardware debugger which enables you to execute your program on the host microcontroller and view variable values, Special Function Registers (SFR), RAM, CODE and EEPROM memory along with the code execution on hardware. Whether you are a beginner, or a professional, this powerful tool with convenient set of commands will enable you to track down bugs quickly. mikroProg™ debugger is one of the fastest, and most reliable debugging tools for ARM® Cortex™-M3 and M4 on the market. Ethernet MCU card with LM3S9B95 (100-pin TQFP) is included in the package with the board. It's also sold separately, if you'd like a spare one to integrate into your own hardware or for any other reason. Board is equipped with Ethernet connector and two signal LEDs which enable you to utilize ethernet feature of Stellaris® microcontrollers. Write UART applications for laptops too. We provided two separate on-board USB-UARTs. TFT with touch screen enables you to develop multimedia applications. 3.3V switching power supply makes sure that each module works correctly. We added two additional GND pins for easier access of your oscilloscope probes. Audio in and out jacks are connected to on-board audio codec chip. With two mikroBUS™ sockets you can add dozens of new functionality to your board with minimum hardware adjustments. Collection of mikroBUS™ compatible Click Boards is growing rapidly, and we have designed them with great care, so you don’t have to make any complicated settings. Just plug your board in, and you are good to go.